Kawasaki’s Keihin Digital Fuel Injection (DFI) system was the first to use two injectors on a motocross bike. Shown here, the first injector is located right at the throttle body, while the second injector, located higher up in the air duct, provides an extra shot of fuel to boost top-end power production. 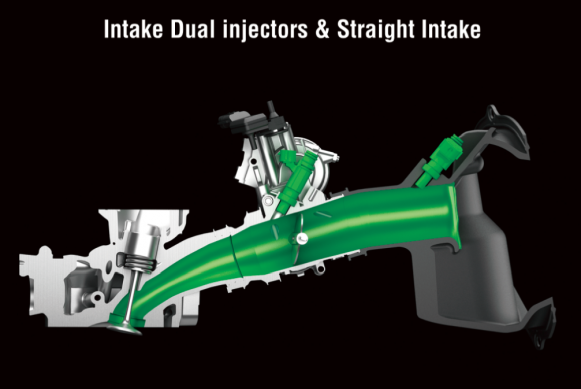 To improve throttle response, the 2015 KX250F’s lower injector fuel droplet size has been reduced from 120 microns to 75 microns for 2015; the upstream injector is unchanged.